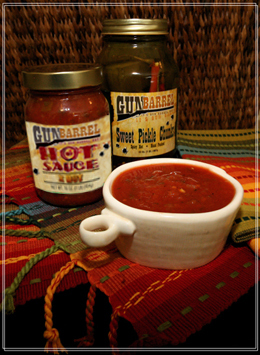 Gun Barrel Hot Sauce started like many other busineses. Someone had a good idea and decided to do something about it! In 1989 on the outskirts of Gun Barrel City on a street called Gun Barrel Lane, Gun Barrel Hot Sauce was born. To this day we think it is the best dog gone hot sauce/salsa in the world. At least its better than the other stuff on the market. We started with a small retail outlet and pretty soon people started asking for the sauce in several neighborhood grocery stores. Before long the sauce spread all across Texas. As they say "the rest is history". Gun Barrel Hot Sauce is made with only the freshest vegetables, finest spices, and ABSOUTELY NO artificial preservatives or dyes. Give us a try. Did we mention that we are the Winner of the "2009 Best In Dallas" and "2010 Best In Dallas" by the Dallas Observer.